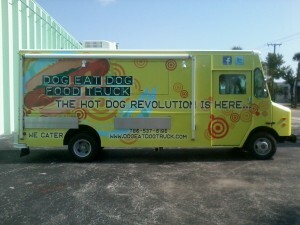 Dog Eat Dog – Miami, FL (@dogeatdogfoodtruck) – Food Truck Talk – Searching for the best foodtrucks! Dog Eat Dog Food Truck offers a great variety of gourmet hot dogs, from the good old classics like Chili Dogs to new creations like the 305 Dog. Also available are the Not Dog (vegetarian) and the After Dog (dessert dog). Homemade potato and sweet potato chips are on the truck. Dr. Brown’s (Black Cherry, Root Beer, and Cream Soda) refreshments are the available, the perfect companion for a hot dog!